This is my addition to the Creative Chaos with Carlos at Ragamuffinsoul.com. 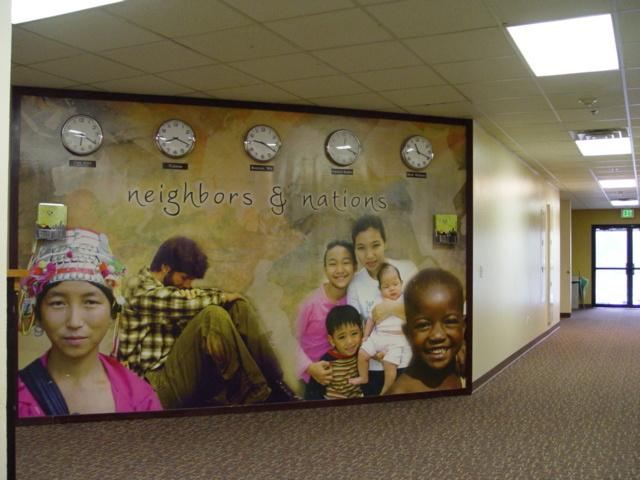 For years we’ve asked the question, how do we keep our “world missions” interest in front of the people who visit our church without doing the ” 50 flags in the worship center” or ” big rotating globe on the stage” or “map on wall with pins” look. We want people to continually see and feel what, how and where we’re doing world missions. We will typically take an entire series during the year and focus on world missions…yet we don’t want our people to loose the sight and vision. So, we had one of our designers put together this image and had it printed on vinyl. The wrapped this wall with the image..posted clocks (nothing creative about that) and also installed some catalog holders so we always have our world & local missions catalog available for everyone. This corner is literally the busiest intersection inside our church. Great use of space, nice picture….reminds me of our world missions efforts every time I see it. We also continue our world missions emphasis on our website. Props to my buddy Lee for coming up with this idea. How do you keep missions in front of your people?